Thursday’s ad is for Kanuhkuhb, or whatever that is in the Cyrillic alphabet. 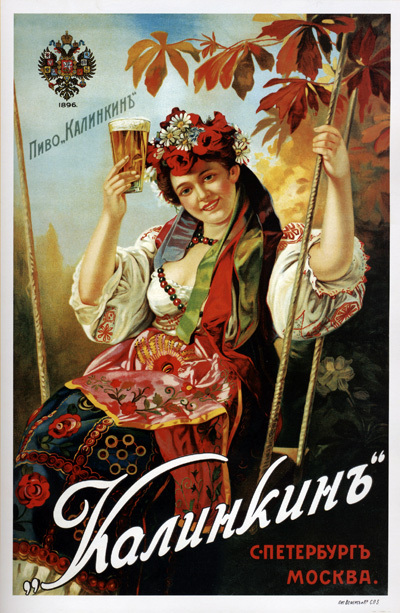 It may be that it’s for Kalinkin Beer, a Russian beer brand, from 1903. It’s a very colorful ad, but who drinks a beer on a swing? It is, in fact, “Kalinkin.” That b-like character at the end is silent, and just slightly modifies the sound of the preceding consonant. What’s a real turn off in the craft beer space are the arrogant and entitled snobs who are ready to give their thoughts on any and every beer in milliseconds — and get all pissy if you don’t agree with them. Let’s face it, if you think wine snobs are douche bags — well, guess what, beer snobs are the exact same thing. Sounds like a whole lot of them were at Cigar City — and between them and the drunks who can’t handle their liquor — created a real mess. Thanks, jerks. Way to go.